On Sunday, the 2012 World Series of Poker continued with the seventh incarnation of the $50,000 Poker Players Championship, which was played in an eight-game format for the third consecutive year. The tournament is designed to test players’ skills in a variety of games, while providing deep stacks and a kind structure to allow for maximum play. That’s exactly what we got on Day 1 as 104 players packed the Tan Section of the Amazon Room for five levels of play; however, that number is sure to go up as registration is open until the start of play on Day 2. Among the players was a laundry list of notables including former champs Brian Rast, Michael “The Grinder” Mizrachi and David Bach; former Main Event winners Doyle Brunson, Huck Seed and Phil Hellmuth; and 2012 WSOP Player of the Year contenders Phil Ivey and John Monnette. While all of those players remained at the end of the night, they all trailed the big stack of Matt Glantz, who bagged up a healthy 310,700 and is primed to improve upon last year’s fifth-place finish. Day 1 featured plenty of action, but due to the deep stacks, eliminations were scarce; in fact, only one player hit the rail, two-time Poker Player’s Championship final tablist David Singer. His elimination came relatively early in Level 3 during pot-limit Omaha when he was in the hijack with an orange T1,000 chip out in front of him. It appeared Bruno Fitoussi had raised to 2,300, Lyle Berman called from the button, Michael Mizrachi did the same from the big blind, and action was back on Singer, who announced a pot-sized three-bet. Mizrachi immediately said the total bet was 11,800, and Singer threw out the chips. Fitoussi tanked for a bit before calling after which Berman and Mizrachi folded. The flop came down , and Singer bet 17,000. Fitoussi only needed five seconds to make up his mind, and he put in the call. The turn was the and Singer checked quickly. 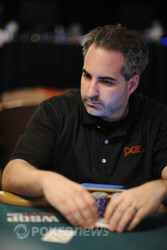 Fitoussi grabbed a big stack of chips and announced a pot-sized bet. The total bet was 52,500 and Singer went into the tank. After a solid minute Singer moved all in, and Fitoussi snap called. Fitoussi had the nut straight, but he still needed to dodge the board from pairing. Singer was looking for an ace, five, four or six in order to stay alive, but the river was the . No luck for Singer who quickly got up and left the tournament area. 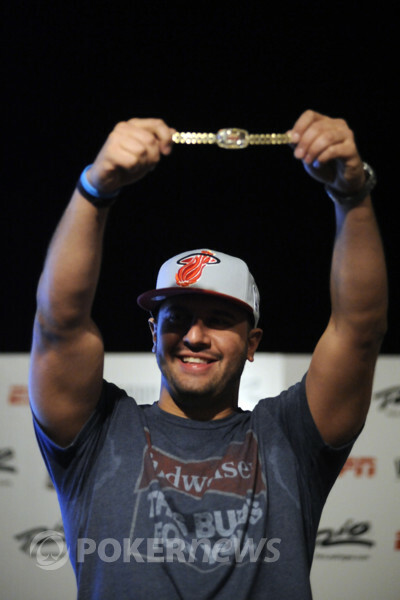 Fitoussi grabbed the chip lead as he moved up to 275,000. Unfortunately for him, he would only decline from there and by the end of the night he bagged 189,600. Other big stacks include Ali Eslami (286,900), Lyle Berman (280,300), Andy Bloch (265,600) and Joe Cassidy (252,400); meanwhile, the defending champ, Rast, is still in contention with 119,200.
Who will become this year’s Poker Players Champion? It’ll take four more days, but eventually someone will be adding his name to the David “Chip” Reese Trophy. Action is set to recommence at 2:00 PM PST, so be sure to join us then as we bring you all the happenings from Day 2 of the 2012 WSOP $50,000 Poker Player’s Championship.